On a positive note, footfall increased this week against the previous week, with a result of +0.3%. However, against last year, visitor numbers to all locations tumbled, impacted by the late payday for many not until the latter end of the week and the freezing weather appearing from Tuesday onwards, resulting in an annual decline of -4.3%. Although this week historically has resulted in a decline against the previous year, this is the greatest drop since 2014 when numbers fell -5.1%. 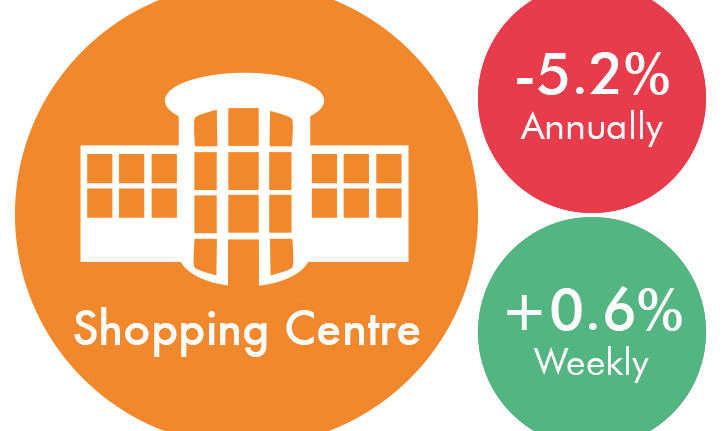 With retail parks experiencing a drop of just -0.6%, the decline was driven by visitors to high streets and shopping centres falling -5.6% and -5.2% respectively: a much larger drop than the -0.9% and -1.2% for the same week in 2018 but in line with the 2014 results of -6.7% and -4.2%. Regionally, the decline was comprehensive with the South West seeing the largest impact, dropping annually by -8.6%. In weekly terms, the inclement weather seems to have been a positive influence for the enclosed and convenient locations of shopping centres and retail parks in comparison to high street locations. High street numbers fell -0.6% against the previous week, with only a few regions recording otherwise, while shopping centres rose +0.6% and retail parks increased +2.3% with increases across the majority of regions.